Hannah Sunderland felt content in her embrace of the Quaker faith...until her twin brother joined the Colonial cause and ended up in jail. She longs to bring some measure of comfort to him in the squalid prison, but her faith forbids it. The Friends believe they are not to take sides, not to take up arms. She is not allowed to visit him, even if she were able to secure a pass. Jeremiah Jones, a Colonial spy, needs access to the jail to help rescue me important to the cause. Upon meeting Hannah, a plan begins to develop. Who would suspect a pious Quaker visiting a loved one? But Jeremiah is unprepared for Hannah, for her determination to do right, to not lie. How can one be a spy and not lie? Hannah, in turn, is surprised by Jeremiah...for the way he forces her to confront her own beliefs, for the sensitivity and concern he shows her despite the wounds he still carries. 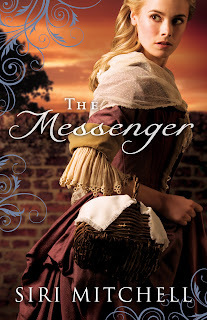 The Messenger tells the story of an unlikely pair: war veteran Jeremiah Jones and young Quaker Hannah Sunderland. With meticulous historical details of the turbulent times during the British Occupation of Philadelphia circa 1778, key themes are faith, familial loyalty and deception. As a Quaker, Hannah is forbidden to choose a political side, be it Loyalist or Rebel, but when her twin brother joins the Rebels, Hannah is torn between faith and justice. Hannah reluctantly decides to team up with Jeremiah Jones and his spy network, despite their many differences of opinion, in efforts to free prisoners and to expose war atrocities. The alternating first person narrative brings the emotions of the duo to the forefront, and the intrigues of the Colonials versus the Redcoats were well plotted as we learned of Jeremiah’s own story as he was maimed during one of the many battles. In an example of opposites attract, it seems that not everyone or everything would be as it appears. Hannah struggles with the pacifist ideals of her faith, and Jeremiah is not as rough as his appearance. With a convincing supporting cast, this is a compelling Christian historical set during a very important time for America.